H influenzae type b and N meningitidis serogroups C and Y-tetanus toxoid conjugate vaccine may be safe to co-administer to infants with other scheduled vaccines. 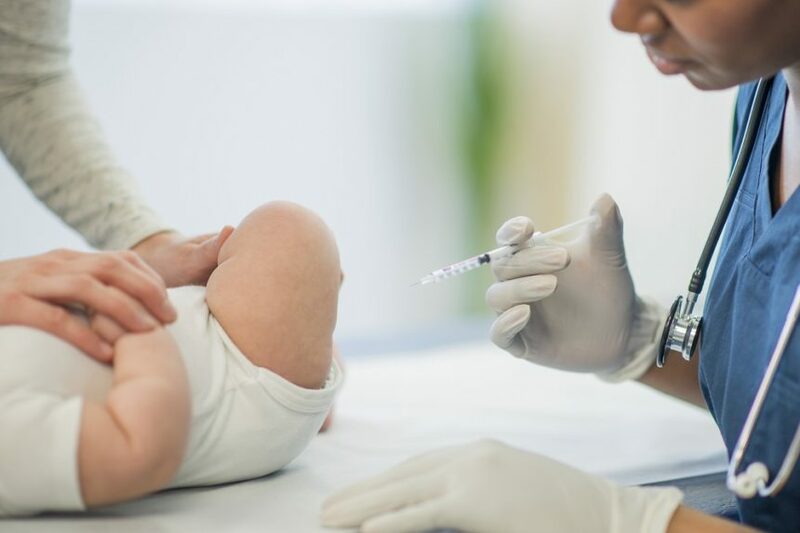 A Haemophilus influenzae type b (Hib) and Neisseria meningitidis serogroups C and Y-tetanus toxoid conjugate vaccine may be safe to co-administer to infants with other scheduled vaccines, according to a study published in Human Vaccines & Immunotherapeutics. The incidence of bacterial meningitis has declined in the United States during the last 20 years, after the introduction of H influenzae type b (Hib) and pneumococcal conjugate vaccines in the routine infant immunization schedules. However, although Streptococcus pneumoniae remained the most common etiologic agent of bacterial meningitis, N meningitidis is the leading cause of meningitis in the US, with serogroups B, C, and Y being responsible for most cases. A combined Hib, meningitis serotypes C and Y, and tetanus toxoid conjugate vaccine (MenHibrix, GSK) was developed and approved by the US Food and Drug Administration in 2012 to protect infants without increasing the number of injections in the US immunization schedule. A previous phase 3 study showed that a 3-dose vaccination series with Hib-meningitis C-meningitis Y-tetanus toxoid in infants aged 2, 4, and 6 months, followed by a fourth dose at 12to 15 months of age had a clinically acceptable safety profile, induced a robust immune response against meningitis C and meningitis Y, and had a similar immunogenicity profile to other licensed Hib vaccines. Therefore, this phase 3, open-label, randomized study (ClinicalTrials.gov identifier: NCT01978093) evaluated the immunogenicity and safety of co-administered Hib-N meningitidis serogroups C and Y-tetanus toxoid conjugate vaccine (MenHibrix) with human rotavirus vaccine, hepatitis A vaccine, and 13-valent pneumococcal conjugate vaccine (PCV13). A total of 600 infants were randomly assigned (1:1) to receive either 4 doses of Hib-N meningitidis serogroups C and Y-tetanus toxoid conjugate vaccine at ages 2, 4, 6 months and 12 to 15 months (n=248) or 3 doses of Hib vaccine conjugated to N meningitidis outer membrane protein complex at the same age milestones (n=303). All infants received human rotavirus vaccine at ages 2 and 4 months; PCV13 at ages 2, 4, 6 months and 12 to 15 months; hepatitis A vaccine at ages 12 to 15 months and 18 to 21 months; and diphtheria-tetanus-acellular pertussis-hepatitis B-inactivated poliovirus vaccine at ages 2, 4, and 6 months. Immune responses were measured against human rotavirus vaccine, hepatitis A and Hib with enzyme-linked assays, and meningitis serotypes C and Y with serum bactericidal assays using human complement. The objectives of this study included demonstrating the noninferiority of a 4-dose vaccination course with Hib-Neisseria meningitis serogroups C and Y-tetanus toxoid conjugate vaccine compared with a 3-dose vaccination course with of Hib vaccine conjugated to N meningitidis outer membrane protein complex, each co-administered with PCV13 and hepatitis A, in terms of anti- polysaccharide polyribosylribitol phosphate antibody concentrations ³1.0 µg/mL. The 4-dose vaccination series with Hib-N meningitidis serogroups C and Y-tetanus toxoid conjugate vaccine induced a robust immune response against Hib, which was noninferior to that induced by a 3-dose vaccination series with of Hib vaccine conjugated to N meningitidis outer membrane protein complex, and against meningitis C and meningitis Y. Hib-Neisseria meningitis serogroups C and Y-tetanus toxoid conjugate vaccine did not interfere with immune responses to concomitantly administered human rotavirus vaccine, PCV13, and hepatitis A. Disclosure: This study and related publication were sponsored by GlaxoSmithKline Biologicals S.A.